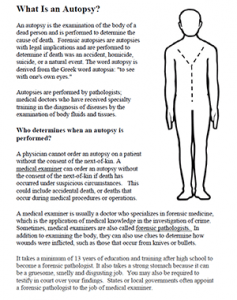 Students read a short article about autopsies and the scientists who perform them, such as forensic pathologists and medical examiners. The text includes references to careers in the field of forensics and what kind of training is necessary for that type of job. The article also includes a detailed description of the procedures involved in an autopsy, such as the removal of organs. Questions at the end of the article require students to engage in close reading in order to analyze the main ideas of the article and to make comparisons between careers described. Students also read selected chapters from “Stiff: The Curious Lives of Human Cadavers” as part of their course work.